Right up there with shopping for back-to-school fashions is buying a new backpack for the school year. 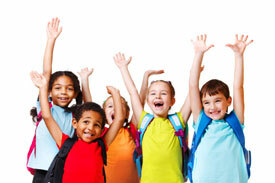 Did you know that many children today are hauling around backpacks that are far too heavy? A child’s backpack should be no more than 10-20% of their body weight. A combination of books, water bottles, gear for after-school sports and more can make that burgeoning backpack a potential health hazard. That’s because your child’s spine is still developing and backpacks that are too heavy can put a strain on a child’s muscles and joints. We recommend that you choose a backpack that has two wide and padded shoulder straps to evenly distribute the weight of the pack and reduce muscle strain or injury. You also may want to choose a backpack that features a waist or chest strap which provides additional support. The obvious advantage of selecting a rolling backpack is it takes the load off your child’s back. It’s just important that your child be able to lift the backpack up a set of stairs if your child’s school doesn’t have ramps or elevators. You also want to select a rolling backpack with a sturdy handle that extends. Instead of your child lugging a days’ worth of books around all day in a backpack, encourage using the locker. It’s a good idea for your child to load and unload their backpack frequently and carry only the essential items at a time. In addition to backpack shopping, consider this back-to-school to do: getting your child’s spine examined. Schedule an appointment today!